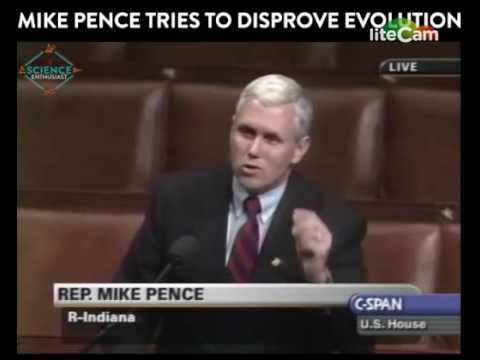 What do you think about Representative Mike Pence's speech about evolution? Though he made it some time ago, I doubt that he would argue any differently now. Update: Note. It is only a little over four minutes long, so it will not take much time to hear it. Update 2: MARK, thanks for your input. Just to clarify for any others who click on this question, evolution is what happens. The theory of evolution is an explanation of HOW it happens. Update 3: ALL scientific theories are explanations of some aspect of nature. Update 4: Jack, that is NOT in the Constitution, nor is it in the Bill of Rights. And some of the Founders were NOT Christians or Bible believers. Thomas Jefferson, for example was a Deist and he likened the Bible to a dung hill. and read it from cover to cover -- and to not talk about evolution until he is finished reading. Makes sense to me the textbooks Misrepresent even what evolution itself teaches especially when they show linear evolution. Pence, like so many Christians, has no idea what evolution is and what it is not. He was a blithering moron then, and he's a blithering moron now. Film at 11. He claimed expertise in history then made a claim that Darwin had just got back from the Galápagos Islands in 1859. He demonstrates that he is ignorant of what the word ‘theory’ means when employed as the scientific term. He claims evolution is taught as a fact in schools. Well, of course it is, because it is a fact. He says a new theory has been proposed. Nope, another thing he gets wrong. He also seems to think that whenever it was, and he stood up and made a fool of himself that we had only discovered that other humans have existed. I really think he was lying about his expertise in history. I would have no objection to teaching evolution as a theory because that is what it is. It is just this stupid man who does not know what a theory is. He wants other theories of origins taught. Now that would pose a major problem. There are no others. He then gets more confused and says creation is a theory. It is not; it is a myth and I presume he also forgets that there are other myth believers besides Christian and Jewish ones. We see a man who was to become the vice-president of the United States of America proposing that people ignore that country’s constitution and teach a religious idea in schools. He also demonstrates bigotry by only wanting his creation myth taught. Some people would like to see Donald Trump removed from the office of president. I hope this does not happen because if it does the imbecile in the video would become the president. The body's "first line of defense" is external, and consists of physical and chemical barriers against microbial pathogens.? Is there a relationship between bone density and muscles in humans?